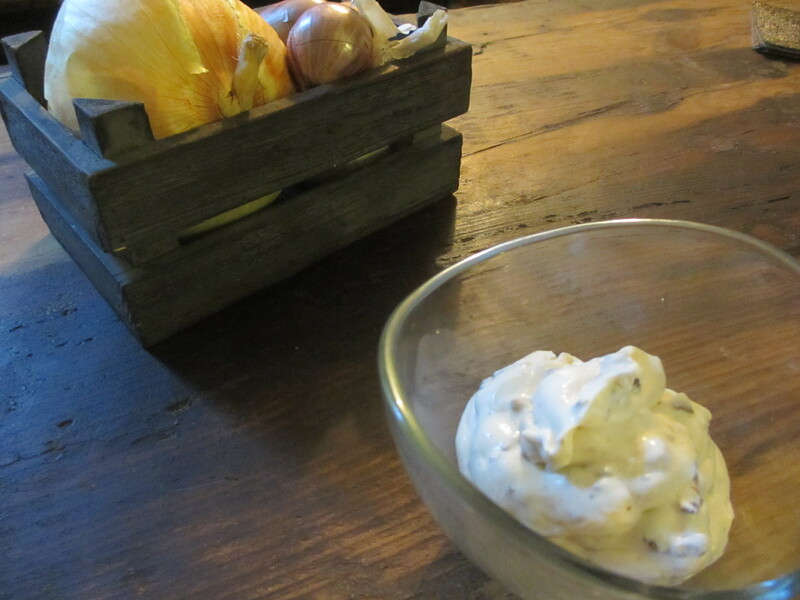 One of my favorite guilty pleasures is enjoying some ridged potato chips with a creamy onion dip. This doesn’t sound so bad, except for the fact that my preferred dip is one that you make by mixing sour cream with a packet of dried onion soup by Lipton. It’s a classic taste that still makes me just as happy as it did when I was a little kid enjoying some at a party, though it’s not something I’ll make a regular part of my diet anytime soon. The reason: That tiny packet hanging out in the back of my pantry has 14 different ingredients in it. No thanks! I set out to try to replicate the flavor and ended up with a slightly more sophisticated twist that I now like even more than the original. 1. Heat a large pan over medium-low. Add the butter and let melt. Add the onions and cook, stirring occasionally, for 15 to 20 minutes or until caramelized. Transfer to a paper towel-lined plate and set aside to cool to room temperature. 2. Transfer crème fraîche to a small bowl. Roughly chop onions and add to bowl. Mix until well combined and add salt to taste. Let sit at room temperature for 15 to 30 minutes before serving. SWWU Tip 1: Want an even more sophisticated flavor? Used caramelized shallots instead.